a co-creation space for all, to make tourism matter on the journey to 2030. In 2015, world governments agreed on a common 2030 Agenda. 17 Sustainable Development Goals (SDGs) geared to end poverty, save our planet and create a prosperous world for all by 2030. Tourism can play a huge part in achieving the SDGs and UNWTO is committed to provide the global tourism community with a space to come together and realize the 2030 Agenda. 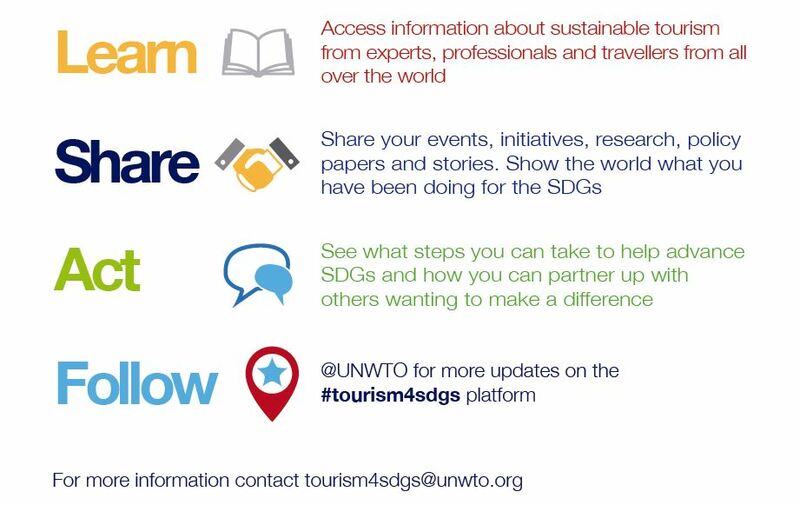 The Tourism for SDGs (T4SDG) is a co-creation platform for all, to make tourism matter on the journey to 2030. Research, education, and training, events, initiatives, policy papers, company CSR and stories- all in one space. Public bodies, international organizations, donors, travellers, companies, academia and civil society and travellers; this space is for you!